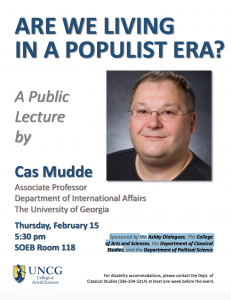 Cas Mudde is an Associate Professor in the School of Public and International Affairs (SPIA) at the University of Georgia in the United States and a Researcher at the Center for Research on Extremism (C-REX) at the University of Oslo in Norway. He was born and raised in the Netherlands, where he got his M.A. and Ph.D. at Leiden University, before embarking on an academic career that has (so far) taken him to universities throughout Europe and the United States. His research agenda addresses the question: how can liberal democracies defend themselves against political challenges without undermining their core values? Most of his work has focused on political challenges from the far right in Europe, while more recent work has also looked at animal rights and environmentalist activists in western democracies and populists across the globe. He is co-editor of the European Journal of Political Research (EJPR), the flagship journal of the European Consortium for Political Research (ECPR). His recent book publications include On Extremism and Democracy in Europe (Routledge, 2016), The Populist Radical Right: A Reader (Routledge, 2017), SYRIZA: The Failure of the Populist Promise (Palgrave, 2017), Populism: A Very Short Introduction (Oxford University Press, 2017), and The Far Right in America (Routledge, 2018). He is currently working on three new books: The Israeli Settler Movement; Assessing and Explaining the Success of Social Movements (for Cambridge University Press), Politics in Populist Times (for Hurst Publishers), and The Populist Radical Right in the 21st Century (for Cambridge University Press). His work has been awarded several (international) awards, including the Friedrich Wilhelm Bessel Research Award from the Alexander von Humboldt Foundation in Germany and the 2008 Stein Rokkan Prize for Comparative Social Science. His books Populist Radical Right Parties in Europe (Cambridge University Press, 2007) and Populism in Europe and the Americas: Corrective or Threat for Democracy? (Cambridge University Press, 2012) were named Outstanding Academic Title by Choice. He has been consulted by a broad variety of state and non-state institutions, including the British Foreign and Commonwealth Office, Canadian Security and Intelligence Service, Council of Europe, European Parliament, Israeli Ministry of Foreign Affairs, Southern Poverty Law Center, Swedish Prime Minister’s Office, US Helsinki Committee, and US State Department. He is a frequent contributor to international media, including The Guardian, New York Times, Reuters, Vice News, and Washington Post. He is also a columnist for Hope not Hate and blogs for HuffPo. He tweets at @casmudde.